To overcome today’s security challenges and gain better protection, organizations need solutions that span the entire attack continuum and are designed based on the tenets of being visibility-driven, threat-focused and platform-based. 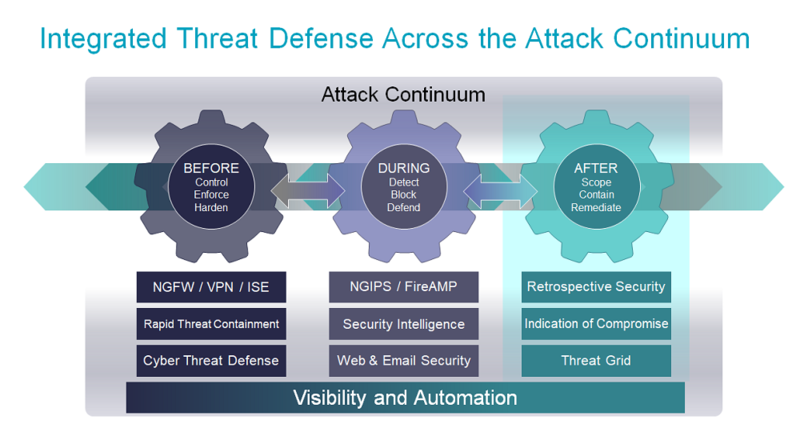 Cisco offers a comprehensive portfolio of threat-centric cybersecurity solutions that span the entire attack continuum. Cisco® Advanced Malware Protection (AMP) is a security solution that addresses the full lifecycle of the advanced malware problem. It not only prevents breaches but also gives you the visibility, context, and control to rapidly detect, contain, and remediate threats if they evade front-line defenses, all cost-effectively and without affecting operational efficiency. Cisco Umbrella Branch is a cloud-delivered security service for the Cisco Integrated Services Router (ISR). It provides the first layer of defense against threats at branch offices. And it offers the simplest, fastest way to protect every device on your branch network. You gain visibility and enforcement at the DNS layer, so you can block requests to malicious domains and IPs before a connection is ever made.